This page is based on Michael Andrews-Reading’s guide to St. Mary’s Church with added information and drawings by Martin Pounce. The numbers and letters in square brackets refer to the attached extract from the family tree showing members of the Drake family and to Martin’s drawings below showing the locations of the Drake memorials in the Drake Chapel and in the church. Additional photographs of the memorials are at the foot of each section using the same numbers and letters. More information is available on this website about the Drake family and about Shardeloes. The Drake Chapel, which is accessed through a late 17th century round-headed doorway in the north wall of the chancel (usually kept locked), was built during the 17th century, and originally served as a vestry-room for the parish. Its conversion into a monument room came about in 1728, upon the death of Montague Garrard Drake. The Squires had enjoyed ancient rights of interment in the chancel at St. Marys up to that time, but it was found that there was insufficient space to accommodate the deceased Lord of the Manor’s burial, particularly with reference to the monument it was proposed to have erected. Mr. Drake’s coffin was temporarily buried in the choir and the Trustees petitioned the Bishop of Lincoln for a licence, which was readily granted, permitting them to take over the room, on the proviso that they also caused a new vestry to be erected. A parish meeting not surprisingly gave consent, and so the room was converted into space for monuments above a large vault, and a vestry duly constructed to the north. The passageway, cordoned off by railings as at present, was installed to enclose the room, and still provide access for the clergy from the chancel to the vestry, without their having to walk around outside the church. The floor level of the Chapel is higher than that of the chancel because of the burial-vaults under the floor. Mountague Garrard Drake (named after his grandfather William, Chief Baron of the Exchequer, whose surname was variously spelled in contemporary records as Montagu, Montague and Mountague) was laid to rest in the vaults and his lavish memorial , by Peter Scheemakers, was erected against the north wall, at the enormous cost of 500 guineas. Opposite it stands the monument  to his son’s wife, Elizabeth, who died in 1757; it is believed to be by Sir Henry Cheere (who had been a pupil of Scheemakers); it portrays the deceased surrounded by her six surviving children, two further deceased children may be represented by the two cherubs seated on the front corners. The memorial  to her husband, William Drake, the builder of Shardeloes House, is by John Bacon the younger; it originally stood in the chancel where the archway presently opens into St. Catherine’s Chapel, and is now in the upper portion of the monument room, to the north of the altar. Interments in the Drake vaults continued until the death of Thomas Drake Tyrwhitt Drake, when they too were found to be full. Permission was again obtained from the Bishop, and in 1811 the room was doubled in size by means of an extension to the east. The original portion of the room is on a lower level, and the addition is accessed by a flight of stone steps. Interments in the extended vaults continued until early this century. Thomas Drake Tyrwhitt Drake’s monument  was also placed originally in the chancel, but now stands to the south of the altar in the Drake Chapel, in front of the unusual child-brass to John Drake. It is by the younger Bacon. Against the north wall of the upper portion of the room is Henry Weekes’ memorial  to Thomas Tyrwhitt-Drake, who was the last member of the family to represent Amersham in Parliament, dying in 1852. A particularly poignant memorial  is that to the Rev’d Arthur Tyrwhitt¬Drake, who collapsed with an apoplectic fit and died in 1831, at the conclusion of his wedding service, aged 31. The oldest monument  presently in the chapel is that to Mrs. Joan Drake née Tothill, consisting of a black marble slab now set in the south-west wall. It was anciently sited in the chancel, and was re-discovered during the excavations under the floor beneath the arch linking the chancel with St. Catherine’s Chapel at the restoration of the latter. It was apparently part of a larger original, an early Visitation record having referred to its shield, now missing. The remainder of the monuments commemorate each generation of the Drakes since they succeeded to the Amersham estates nearly 400 years ago. In 1966-7 Captain Francis Tyrwhitt-Drake, then Squire, had the room converted into a Chapel at his own expense, erecting the present wrought iron railings to a design by Sebastian Comper. He generously presented it to St. Mary’s. It was dedicated by the Bishop of Oxford on 18th April 1967, and is used for occasional week-day Communion services and for the signing of the register during weddings. Thomas T-D (1783-1852). This photo was taken c. 1855 by Rev. William Thomas Tyrwhitt Drake (1835-1915). He was one of the handful of amateur photographers who was permitted to use Fox-Talbot’s Calotype process, the first negative positive photographic printing process. This image was kindly provided by Barney Tyrwhitt-Drake, the photographer’s great grandson. To the north of the High Altar stands the monument [A] to Sir William Drake, who died in 1669, with a half-length marble statue of the blind Baronet, draped in his funereal shroud and flanked by two laureated skulls. The darkened slabs set into the base of this memorial contain Latin eulogies to his grandparents, William and Catherine Tothill, who both died in 1626, and to his mother Joan Drake, according to scarcely credible lore the only one of their 33 children to survive childhood and marry; she died in 1625. All four lie buried beneath the chancel. To the west, above the doorway into the Drake Chapel is a marble tablet [B] surmounted by the Drake arms memorialising five infant children of Sir William’s nephew, the second Sir William Drake, who died between 1671 and 1681. 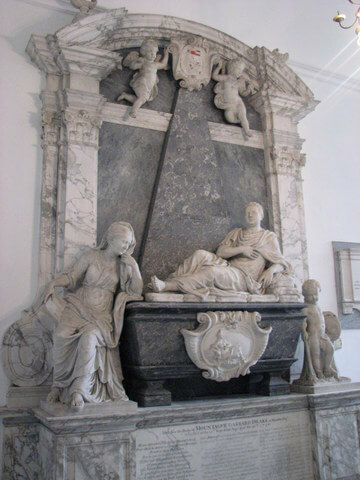 On the south side of the Altar is a monument [C] in the form of a black marble sarcophagus between two pillars; above it are two medallions, bearing portraits of Montague Drake and Jane his wife, who died in 1698 and 1724 respectively. It is signed by Andrew Carpenter, but may have been designed by Gibbs who has it depicted in the book of his designs; it cost £180.